Composed by Old English Christmas Carol. Arranged by Betsy Lee Bailey. Sacred, Praise & Worship, General Worship, Christmas. Octavo. 8 pages. Published by Betsy Lee Bailey (S0.20545). 2015 Holiday Contest - "What Child Is This?" 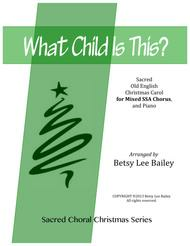 always a favorite at Christmas is arranged here for 3-part Treble Chorus and piano. The parts are quite accessible is each range, perfect for the intermediate chorus or trio of singers. High note is F for the Sopranos and low note is G for the Altos.